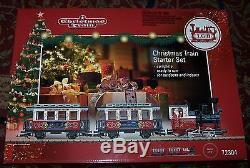 G SCALE LGB 72304 ULTRA CHRISTMAS STARTER SET. 0-4-0 STEAM ENGINE HAS SMOKE + EXTRA AMBER LED CAB LIGHTS WITH SUPER CAPS. EXTRAS INCLUDE QUAD (4) WARM WHITE "GOLD" LED LIGHTING +. ANTI-FLICKER SUPER CAPS IN EACH COACH (2 COACHES). LGB CHROME/BRASS SPOKE WHEELS & CARBON BRUSH ELECTRICAL PICK-UPS. ALL INSTALLED AND 100% READY TO RUN. 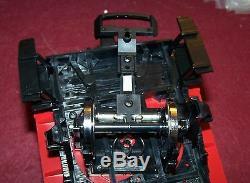 HAS POWER PACK AND THROTTLE WITH TRACK HOOK-UP WIRE-CLAMPS. 4 FOOT DIAMETER LGB SOLID BRASS TRACK, (47 1/4). SMALL BOTTLE OF LGB SMOKE FLUID. INCLUDES SANTA FOR YOUR PLACEMENT. BRAND NEW IN BOX, MINT. EVERYTHING YOU NEED +++ MANY EXTRAS. THESE ARE BUILT IN GERMANY. AURORACROSSING ELECTRONICS, GUARANTEED FOR LIFE. 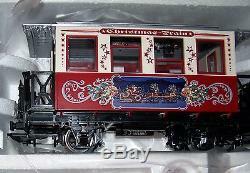 The item "LGB CHRISTMAS SET 72304+EXTRAS, LGB STEEL WHEELS+LED LIGHTING+ANTI-FLICKER CAPS" is in sale since Tuesday, July 17, 2018. 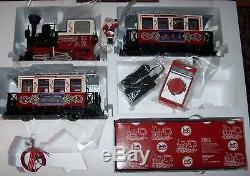 This item is in the category "Toys & Hobbies\Model Railroads & Trains\G Scale\Passenger Cars". 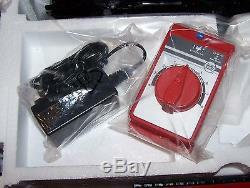 The seller is "auroracrossing" and is located in Plainfield, Illinois. This item can be shipped to United States.